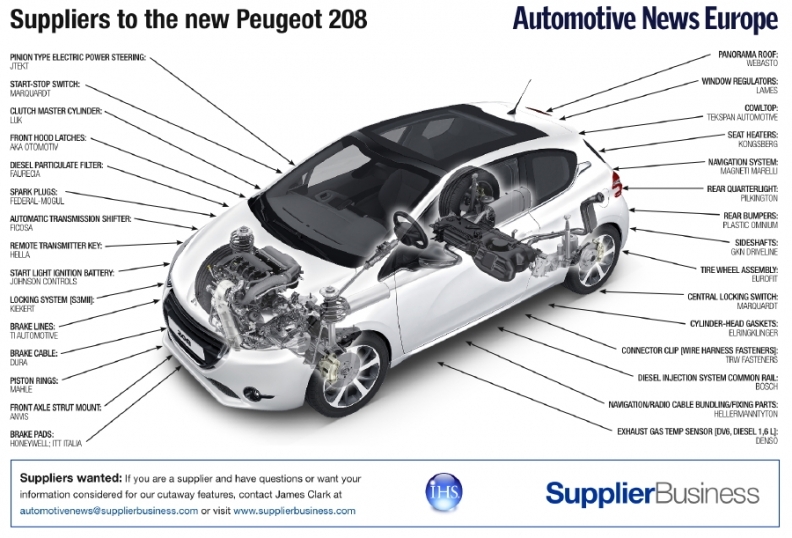 The Peugeot 208 features a rear bumper from Plastic Omnium that is made from 100 percent recycled materials. The French supplier's so-called "Greenlene" is made from crushed polypropylene taken from scrapped vehicles and is sourced to 208s made at Peugeot's two plants in France. In total, 25 percent of the 208 is made using recycled or natural materials while its predecessor, the 207, contained just 7 percent. In addition to the rear bumper, Plastic Omnium also supplies the new Peugeot subcompact's spoiler. The 208 has electric power steering from by JTEKT of Japan. The power assist unit is attached to the pinion shaft of the steering gear and located in the engine compartment to reduce noise in the passenger compartment and allow the use of higher assist forces. The 208's cockpit is designed to put information directly in front of the driver. This is achieved by using a smaller steering wheel and a raised instrument cluster. Marquardt GmbH supplies the control panel, steering wheel control panel, gearshift switch and stop-start switch. In addition, the company provides the 208 with various other switches as well as its electromechanical parking brake. Peugeot started making the 208 at its plant in Trnava, Slovakia, in November 2011. Output began at the company's factory in Poissy, France, in January of this year and the subcompact also will be made at Peugeot's factory in Mulhouse, France, starting in October. IHS Automotive forecasts 208 output will peak in 2013 at 191,150 units from the three plants. Peugeot invested 150 million euros in the Poissy plant, where it added 700 workers in 2011 ahead of production start up. The carmaker invested 100 million euros in Mulhouse to get it ready to make the 208, which is expected to be the automaker's top-selling model in Europe once it reaches full production.